For my sisters who are tired. Who are unsure. Who are in need of encouragement and a reminder of who you are. My gift to you in hope that you will find hope. When I am erased from the political conversation, I remember Dorothy's refusal to be dissected and forgotten by fighting for her race and her womanhood. I remember Shirley's audacious path into politics, taking to new heights our involvement in shaping national policy. When my appearance doesn't suit the sensibilities of others, I remember Lauryn's locs, Angela's fro, and Coretta's curls. When I am told I am too much, I remember Sojourner's bared breasts proving the truth, the strength of her womanhood before a crowd and I declare before the world Maya's words "I am a woman, phenomenally." When I feel alone, I remember Billie's seering song, Nina's longing for freedom and Aretha's demand for r.e.s.p.e.c.t. 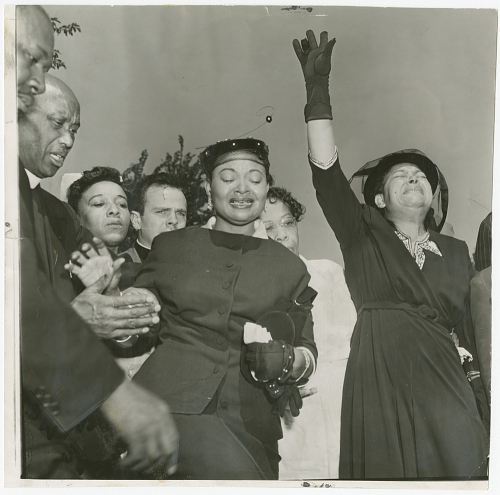 When for the dozenth time I've heard the phrase, "We just aren't ready for those kinds of changes, yet," I remember Mae's courageous flight into the stars and Mamie's daring decision to reveal the depths of America's racial sickness to itself. When I am told I need to give more, I remember Audre's words, "Caring for myself is not self-indulgence; it is self-preservation, and that is in act of political warfare." When my feelings and experiences are invalidated, I remember Rosa's determination sparked a citywide boycott and Pauli's fearlessness in sharing her discontent over the treatment of black women leaders in the Civil Rights Movement. When I am struggling to hold onto myself, I remember Nikki's ego trippin' and I...can fly like a bird in the sky. When I am called toxic because my work challenges the status quo, I remember Ida's dangerous crusade against normalized terrorism and Maria's revolt against social convention defending her right to speak before any crowd. When I am told how far I can go, I remember Harriet's train crisscrossing the country for the sake of freedom. Sometimes the days are unrelenting and night withholds rest. But even in these moments when the world hopes to define who I am and what I can contribute, I remember. The women. Who came before, who opened doors, who dared to be great, whose legacies live on.